A perfect day for sweet tooth Londoners in Covent Garden. Thanks to Angie for letting me know about the event. Did you have a taste? No the queue was rather long and the day very hot. It did look good though. Oh my goodness..... this cupcake is soooo perfect for my website ! Well done for capturing it ! Amazing! What was going on? I love the cookie place there - Ben's! Oh, WOW, what a fantastic cake! A real birthday cake. It looks as if everyone were enjoying themselves, as well they should! What a super fun day. I'm having a cup cake tomorrow, this looks delicious!! Was it edible? you didn't tell us if you had a taste! It looks as if some pretty young girl dressed in pink polkadots would be jumping out at any minute! 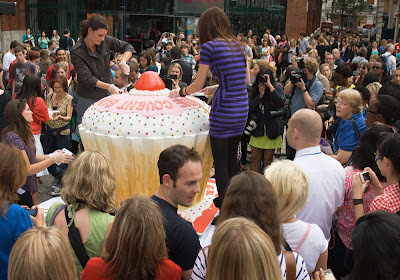 Unbelievable size cupcake. That's great you didn't miss it. It's a once in a lifetime event. Very well snapped given those crowds. I feel like someone could pop up out anytime from the cupcake :).